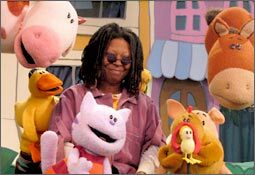 Whoopi's Littleburg (also known as Littleburg) is an American children's live-action/puppetry television series that originally aired on Nick Jr. from January 18 to June 7, 2004. It was created by Jonny Belt and Robert Scull, later known for developing the animated series Bubble Guppies, and produced by actress and comedienne Whoopi Goldberg, who also starred in the show as a live-action role. 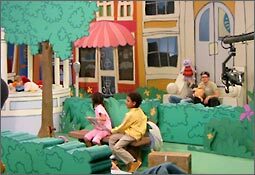 The series focuses on the titular town of Littleburg, known as the "Preschool Capital of the World" for the fact that preschoolers run a majority of the town. The main protagonist, a young piglet named Spencer (voiced by Sean Curley), has just moved to the town with his family and interacts with its friendly citizens while learning important life lessons. Additional characters include the titular mayor of Littleburg, Mayor Whoopi (portrayed by Whoopi Goldberg), Spencer's friend, Tiger Jane (voiced by Sofie Zamchick), and Spencer's mom, Mrs. Piggle (voiced by Mary Birdsong). Actresses Rosie Perez, Mary Testa, and Sandra Bernhard also made guest appearances on the show. The show's music was composed by Goldberg, Dr. John, Guy Davis, and John Platania. The series consisted of three half-hour episodes, none of which are currently known to be available online in video form. The series' soundtrack was available on the Radio section of NickJr.com for several years until the website was eventually redesigned. 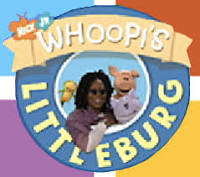 A backup of the Nick Jr. Radio files, including the songs from Whoopi's Littleburg, is available on MEGA courtesy of LMW forums user "tomysshadow". The show's theme song (audio only). Another logo from the show. A possible image from the show. A set from the show. 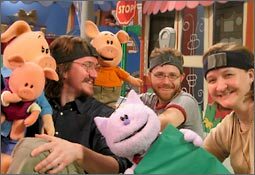 A photo of the show's puppet characters with (presumably) their puppeteers. A thumbnail of the show's main protagonist, Spencer. A thumbnail, presumably of Spencer's younger sister, Peggy. The show's page on NickJr.com. (archived) 14 Dec '06.